"Such religious propaganda has created suspicion and distrust, leading to division and disharmony in the country," President Muhammadu Buhari says. President Muhammadu Buhari wants the world to know that he has no plans of Islamising Nigeria. 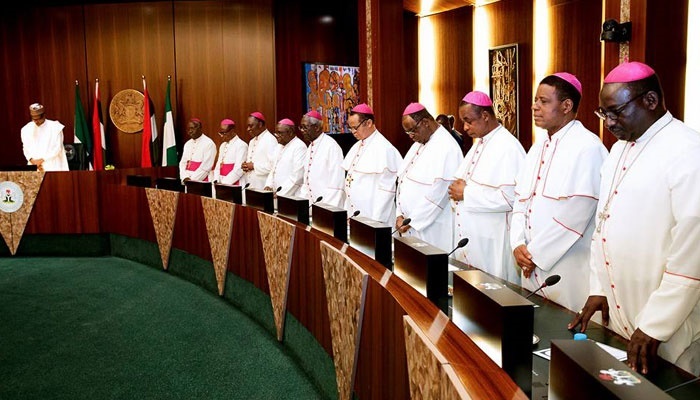 Delivering a speech at the closing ceremony of the Catholic Bishops Conference of Nigeria (CBCN) on Sunday, Buhari said contrary to the propaganda and narrative being promoted by some mischievous politicians, there was no fact to indicate that the present administration was out to Islamise Nigeria. Represented at the event by the Secretary to the Government of the Federation, Boss Mustapha, Buhari said such religious propaganda has created suspicion and distrust, leading to division and disharmony in Nigeria. “There has been a lot of negative propaganda being instigated by outsiders and finds narrative in the church that there is a plan to islamise Nigeria without any credible fact. "The issue of membership of Nigeria to OIC, Shariah and farmers/herdsmen clashes had created a lot of suspicion in the minds of the people despite the fact that the problems had existed in the country for several decades,” Buhari said. Buhari noted that Christian and Muslim religious leaders have been victims of killings in some parts of Nigeria.